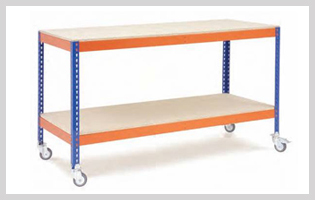 Our range of portable and mobile workbench contains wheels for the mobility. It can easily move with wheels to the working area. It is suitable to all kind of flooring. Industrial Workstations are sturdily constructed with rigid welded joints. It works with vibration free manner also for the heavy duty work. It is highly demanded for various industrial as well as commercial operations of different industries. We provide ergonomically designed workbenches, made from the high grade material, with rigid welded joints. Sturdily constructed workbenches ideally perform in daily heavy duty work in the workshops with smooth and vibration free manner. The workbench tops provide effective protection against the oil, grease, water and dirt. Our workbenches are demanding for the various kinds of cargo, electrical industry, for the packaging of various products of food industry and also for the small packing of the other industries. Our range includes drawer workbench with many options. It contains multiple choice drawers with partition and divider, which is suitable to keep all size of tools and accessories with categorize manner.